The little Spooky, a daring young ghost, wants to join the circle of extraordinary specters. To be accepted, he must pass a scary entrance exam before midnight! Will you help Spooky and manage to guide him in the castle? 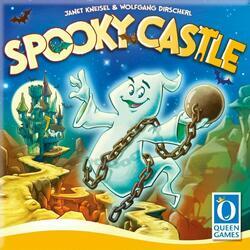 You all play together and your goal is to help the young Spooky Ghost pass the Ghost Castle Entrance Exam. The players play the role of Spooky each turn. To do this, they put Spooky's mask on their eyes and blindly fumble in the Ghost Castle using the spectral wand. Meanwhile, their teammates guide them to cross the castle and retrieve the magic items. When a player recovers two objects, another takes the role of Spooky. But be careful: adult ghosts roam the castle, and time is running out. Your common mission is to complete all the quests on the cards in a limited time. If you accomplish this feat, you win the game and the little Spooky is accepted into the circle of extraordinary ghosts!